Maggie and Owen got to come over to my house this morning for some Mer time because Lily had to work and Jason was doing his parental duty by going on a field trip with Gibson's class to the Jr. Museum. When they arrived, Owen went straight to the couch where I'd already tucked in a sheet and arranged the pillows, laid down and pulled up the very soft blanket. That poor boy. He is still sick and slept for almost four hours today. 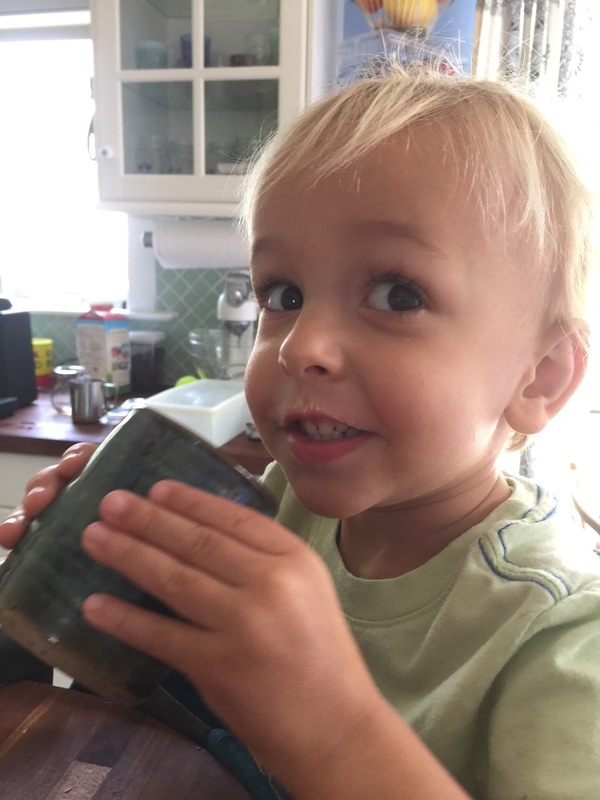 He did want some cheese toast, just like yesterday, and I made some and he said he wanted some smoothie but he hardly drank a bit of it. Every time I'd wake him and ask if he wanted anything or if he wouldn't please have a few sips of Gator Aid, he'd say, "Not now, Mer. Thank-you," and turn over and be right back in what he later referred to as his "magic sleep world." However, if Ms. Magnolia June had the same thing as Owen, she certainly got over it quickly. The picture above is what she looked like eating her own cheese toast. I have never met a human being in my life whose face reflected joy the way Maggie's does. 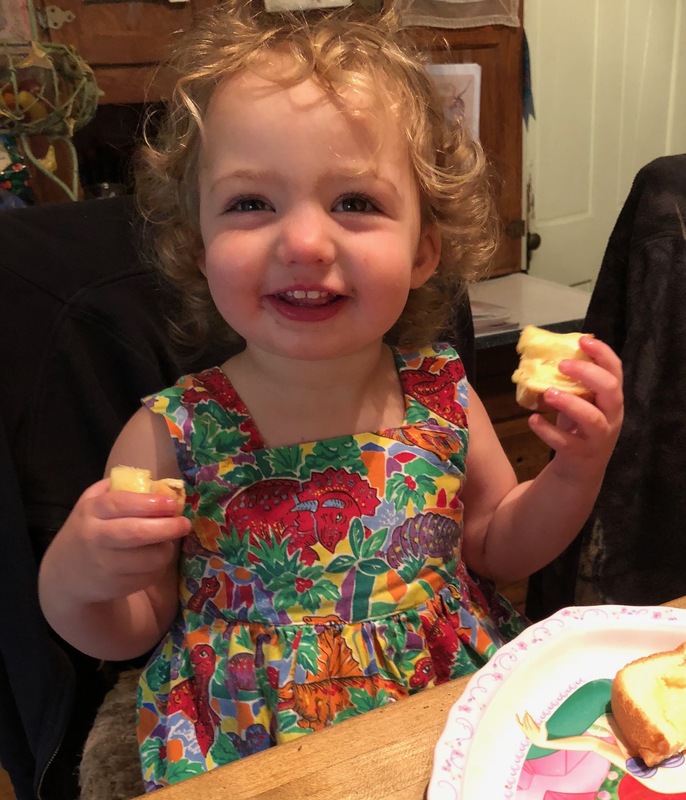 Sitting in Mer's kitchen, eating cheese toast and having a chat with her grandmother is obviously about the most fun she can possibly imagine. It was another easy, restful day. Maggie is what I call a "project child." Give her something that interests her and she's good for a long while. I let her play with my button tin and she was happy for at least forty-five minutes. Occasionally she'd drop some of the buttons and say, "Uh-oh," and I'd help her pick them up and she'd say, "Thank-you, Mer," and my heart just about exploded. 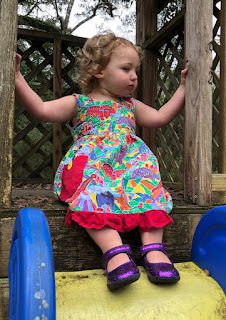 We read some books and we went outside to look for eggs and she wanted to swing and to go down the slide. And yes, those are purple glitter shoes and yes, she does love them. It's so odd and so wonderful to have this one baby girl grandchild. I don't think I treat her any differently than I did my grandsons but who knows? I know for sure that she's as brave and daring as any of the boys and I do not discourage that. Why would I? But she honestly cares more about what she wears than her brothers ever did and that's just the truth. She's also more interested in baby dolls which have been here for all of the grandchildren. I guess I just have to say that with each of them, there are differences and there are similarities and I cherish all of it and love them each and every one exactly for who they are. 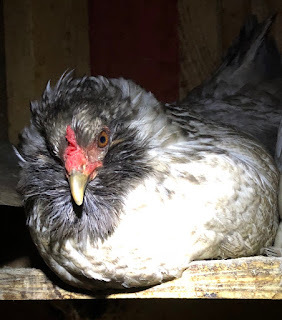 When Maggie and I were on the back porch, Miss Camellia came in to make a visit which disturbed Maggie a bit and when you think about it, a full-grown hen is almost half as tall as a toddler which might well be a bit scary. Here's a picture I took of tiny Miss Violet on the roost tonight. Is that not a dinosaur? But I showed Maggie how Camellia would eat cat food out of my hand and said, "See? She doesn't hurt me," and after that, Maggie was not so worried. To tell you the truth, children around here have a lot more to fear from Maurice than than they do the small dinosaurs. While I was watching Owen and Magnolia, Mr. Moon was over at Jessie's house, watching August while Jessie went to the doctor. We kept trading pictures. And so the day was like that- Mr. Moon and I fulfilling our human-species-evolved grandparenting destinies by trying to do whatever we need to do to make our children's life a little easier and loving on our grandchildren so that they will grow up to be happier and healthier adults. I believe that what we call love is not only the energy source that runs the universe but is the energy source that runs us as well. And there are a lot of different types of love but the love of grandchildren is one of the most fun. And if the need for a nap after experiencing it is any indication of its strength, then it's powerful as hell. Now my very good day is complete. I am SO glad you had a very good day! Hugging you and smiling. And loving you too. I miss my granddaughters so much. I think grandparents are an important part of a child's life, even though I didn't know my own. My mum was a wonderful grandma. Thank you for sharing the photos. I does my heart good. Sometimes I feel so self-indulgent, posting these many pictures of my grandchildren so thank you for saying what you did about them. And I agree- grandparents are HUGELY important in children's lives. I know that to be true from my own grandparents and am so grateful to be able to be a part of these children's lives. Maggie’s face is pure radiant joy. I’m so sorry Owen is still under the weather. Poor kid. Isn't Maggie just a lamp of joy glory? I swear. I can practically feel the way Owen must have felt today. The way I got to feel at my grandma's house many many times. When sick and when not sick. I feel like I got a hug from my grandma reading that. Oh, Jill. I would hug you for real if I could. I’m hoping Iwrn feels better soon. Poor guy! That Maggie!!!! She is one beautiful child! The dress you made, those choose, the little curls!!! You just want to squeeze her! Do any of your grands like to play with your long hair? I did that with my grandma. She didn’t speak english and I was enthralled with combing and braiding her hair! Little Gus looks perfectly satisfied too. Carry on. Owen will occasionally brush my hair but none of them really care about it much. How I wish they did! Maybe Maggie will. Why aren't you famous? Honestly, the way you write and spin tales and draw warmth and reflect it should make you famous. Oh, Elizabeth. I just love you so much. poor Owen. and that Maggie! Yep. That about sums it all up. 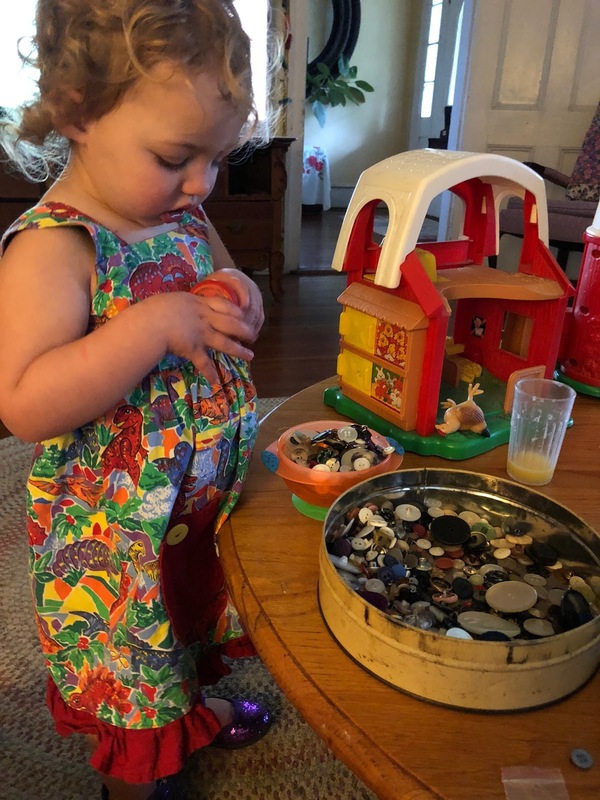 It IS funny how Maggie is drawn to the dolls and the colorful clothes more than the boys were. It's only a problem when people INSIST that girls be enthusiastic about dolls and clothes, right?